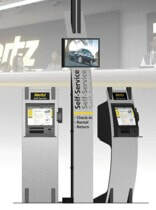 IndexID designed, developed, and produced a Self-Service Kiosk for The Hertz Corporation. 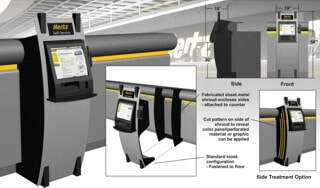 Working with a short timeline of 6 weeks from design to prototype to production, 130 units were completed and shipped to airport locations nationwide and overseas. 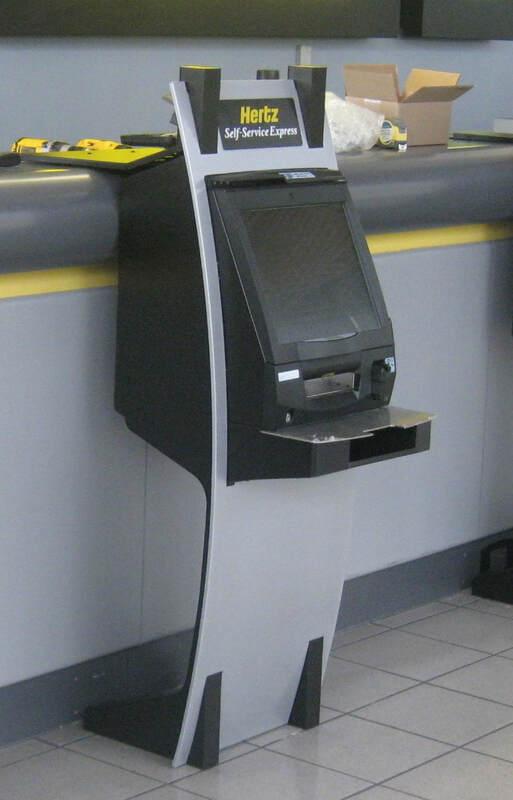 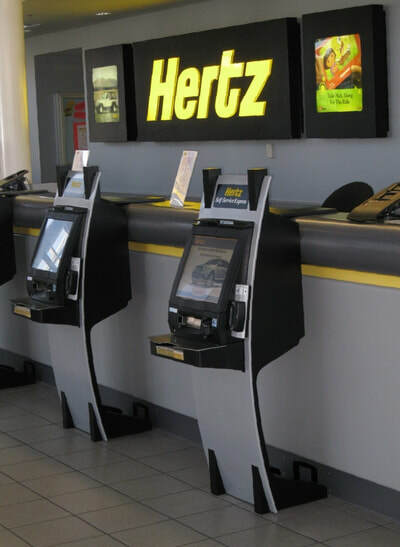 Components specified by Hertz included a NCR Touchport II terminal and an Intellicheck DCM credit card reader. 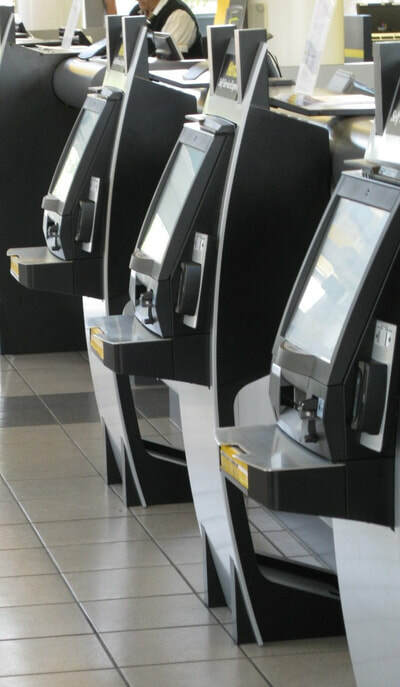 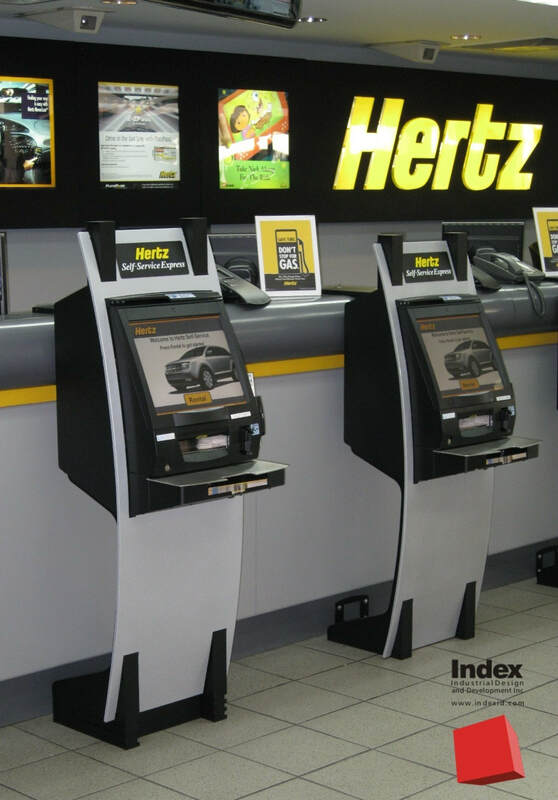 IndexID coordinated with Hertz and NCR to ensure that all of the specifications and equipment functionality requirements were incorporated into the design of the Self-Service Kiosk. 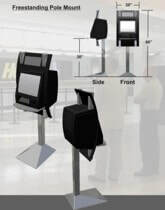 Federal ADA requirements regarding reach distances, display heights, card reader placement, etc... were researched and incorporated into the design of the Self-Service Kiosk. 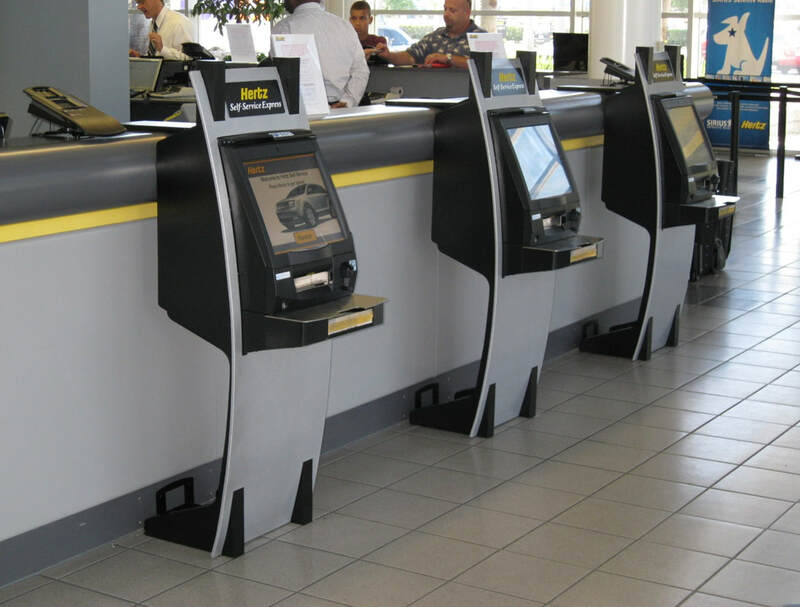 Research was conducted on the design, styling, usage, and placement of existing self-service kiosk units. 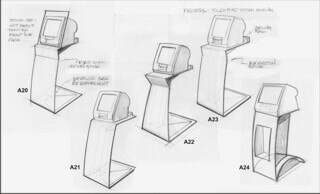 Concept sketches were developed for the Self-Service Kiosk Enclosure. 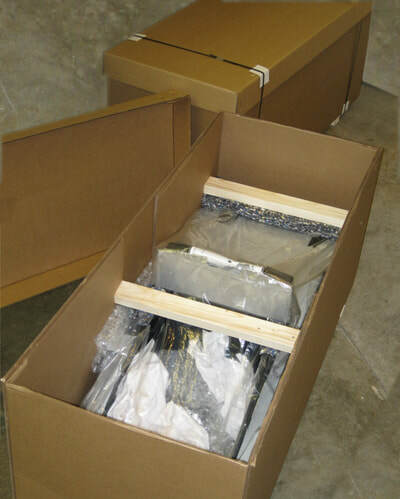 Fabrication and manufacturing considerations led to the use of fabricated metal components over molded components due to the short project time schedule. 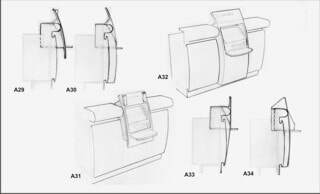 From the initial concept sketches, three different design directions were chosen: Curve, Sandwich and Shear Styles. 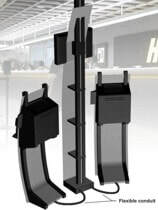 Various mounting and installation configurations were explored, including separate accessories for wire and cable management and LCD monitor mounting. 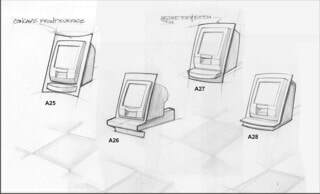 Each of the three concept styles was developed into kiosk, pedestal, and wall mount configurations using the same design language for each. 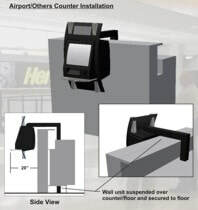 The kiosk configurations created a freestanding enclosure for the Touchport II terminal, the pedestals provided a shelf surface for the terminal, and wall-mount concepts allow for either surface-mounted or partially recess-mounted units. 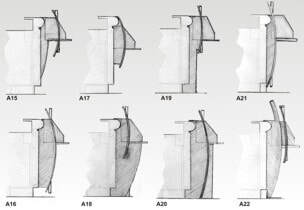 Rough 3D form models were created of each concept using Inventor 2008, giving the concepts accurate dimensions and scale, and allowing the forms to be rotated and viewed from all angles. 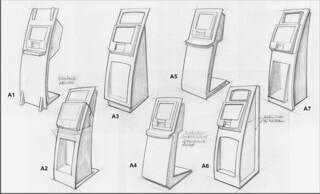 Concepts were developed for methods to integrate the Self-Service Kiosk into an existing counter shell, using design details and language from the Curve Style concepts chosen by the client. 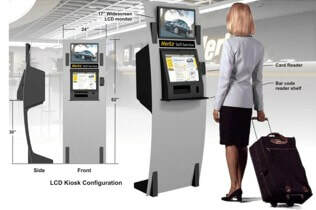 The integration of a LCD monitor into the top of the Self-Service Kiosk creates the opportunity to present additional information to the customer while the Touchport II terminal is in use. 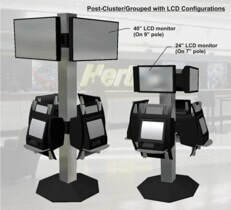 Supplemental product configurations and installation schemes were explored, including grouped freestanding installations, pole-mounted units, and various options and modifications for mounting Self-Service Kiosks to an existing counter. 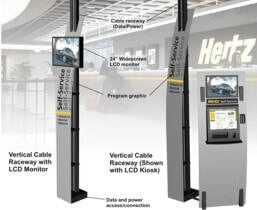 The Vertical Cable Raceway provides a means to get power and data lines to Self-Service Kiosks that are placed out in the Car Rental Lobby area, keeping wires hidden and out of the way. 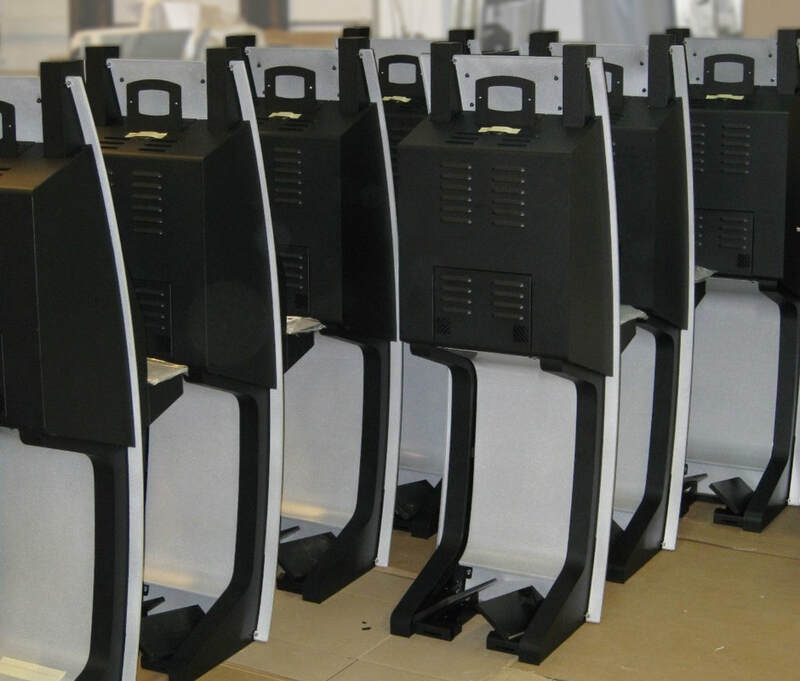 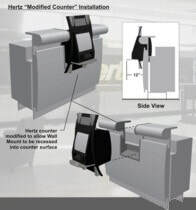 Power and data wiring details are considered, including removable access panels, internal junction boxes and connections, flexible conduit and clips, and conduit for connections between kiosks. 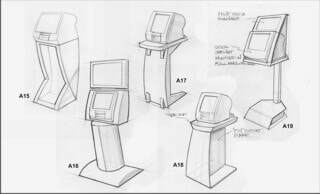 Different component color schemes and surface textures were studied. The yellow, black & silver color palette was chosen to coordinate with Corporate Standards for typical lobby surroundings. 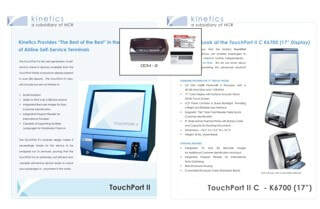 Graphic studies included concepts for Dual-Branding options. 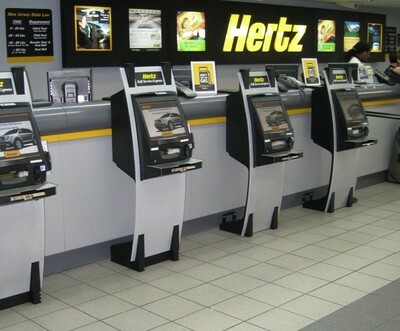 The standard Self-Service Kiosk can be converted for use with multiple Car Rental Programs by replacing the easily-removable graphic header panel with the appropriate signage. 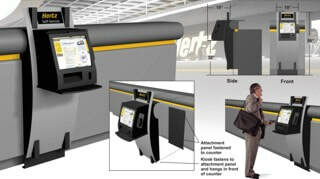 Signage to direct customers through the lobby to the Self-Service Kiosks was developed using similar forms, graphics, and colors that were chosen for the kiosks. This signage needed to be produced quickly, utilizing a fabricated metal base to provide weight and balance and a lightweight, painted sintra panel with applied vinyl graphics. 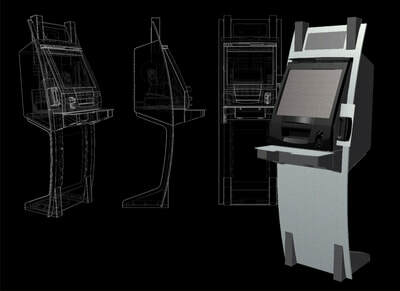 The Autodesk Inventor 3D models created during the Design Development phase are refined. 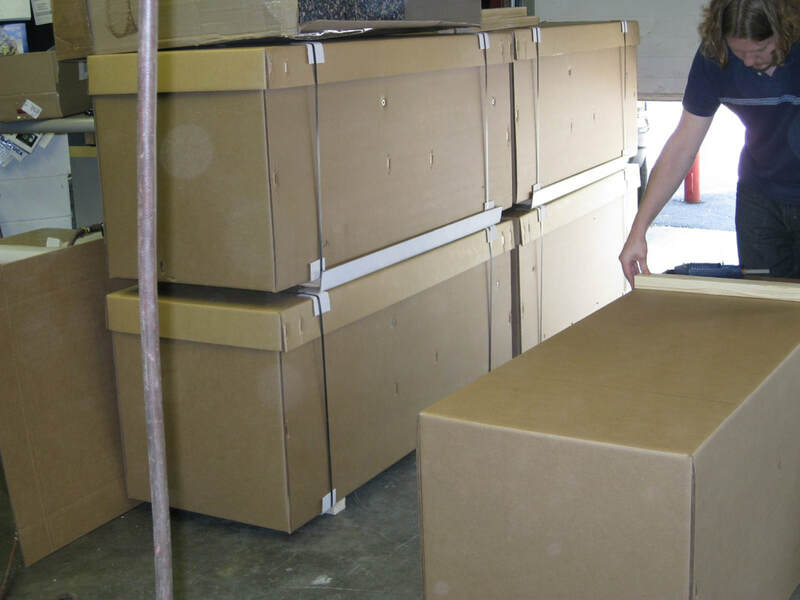 Each individual part is fully detailed, taking fabrication and manufacturing methods, final assembly, and service access details into consideration. 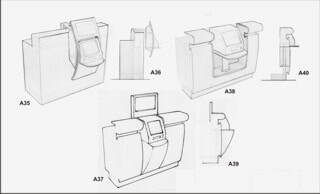 Prototype fabrication drawings were created by IndexID from the 3D parametric model for over 40 individual Self-Service Kiosk Enclosure parts. 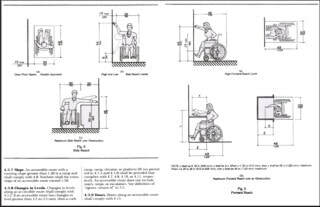 The documents include overall assembly views, exploded assemblies, welded sub-assemblies, and complete individual part drawings. 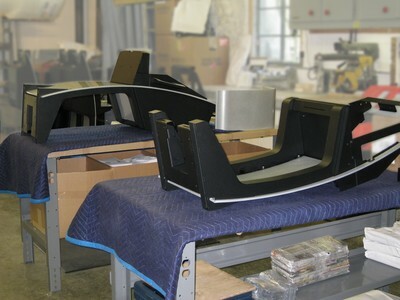 Prototype parts were fabricated and assembled to check for fit and alignment. Any necessary tweaks and adjustments were made to the parts and the drawings, then the parts were disassembled and final finishes were applied. The prototype Self-Service Kiosk was then assembled and installed at IndexID for design review & evaluation by Hertz. After the initial in-house prototype review, six prototype Self-Service Kiosk Enclosures were manufactured and installed in a Hertz facility. 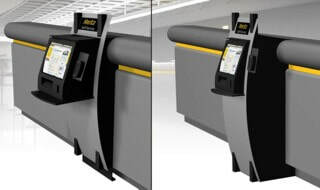 The Touchport II terminals and Intellicheck DCM card readers were installed and connected to the Reservations System, ready for use by customers. In order to obtain installation approvals from the various Airport Authorities across the country, a comprehensive document was created by IndexID detailing the specific locations and methods of installation used for the Self-Service Kiosk. 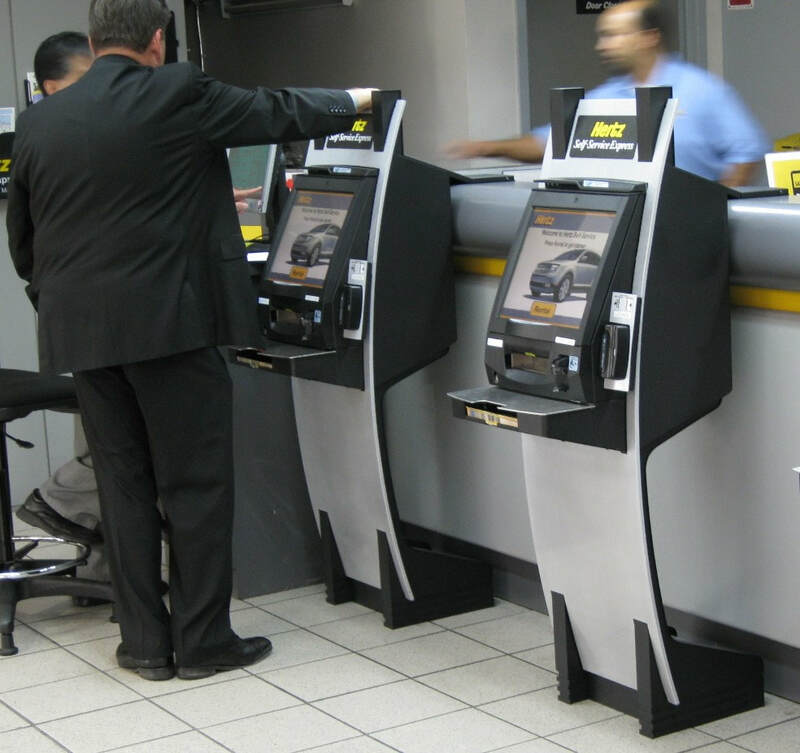 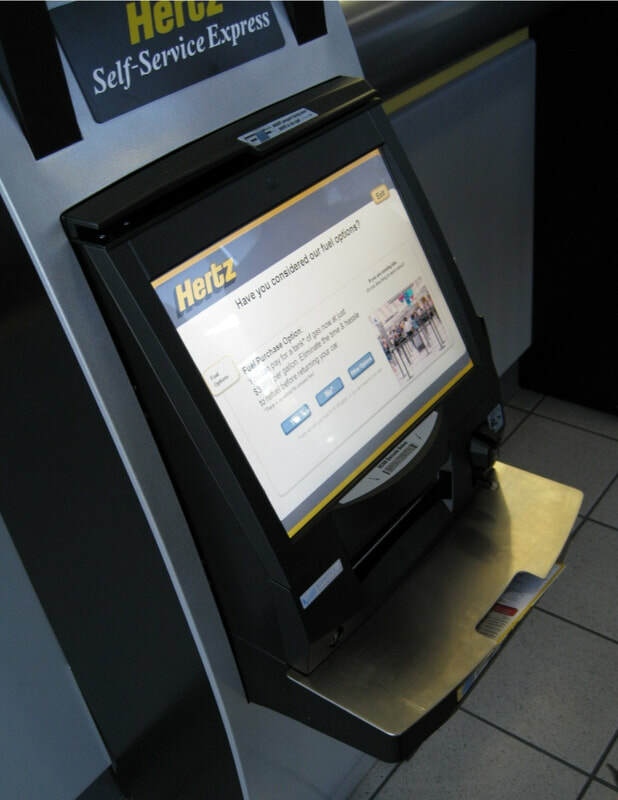 Once the on-site prototype units were reviewed and approved by Hertz, IndexID fabricated, assembled, packaged, and shipped 130 Self-Service Kiosk Enclosures to Airport locations. 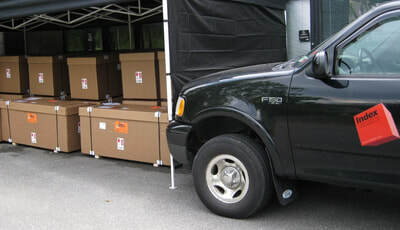 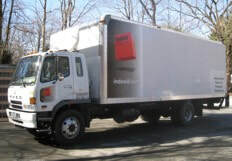 Custom shipping containers were created to protect the units in transit. Detailed assembly and installation instructions were included with each unit, along with associated components, such as surge protectors, graphic panels, installation brackets and mounting hardware. 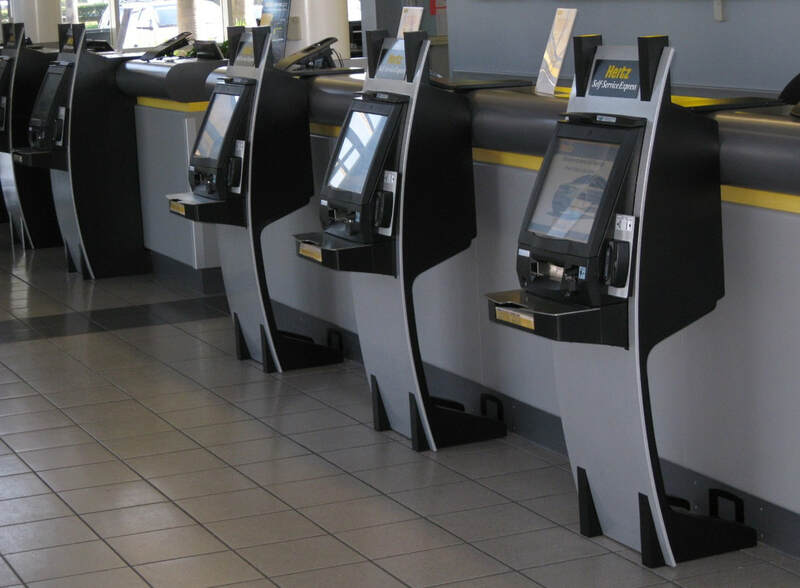 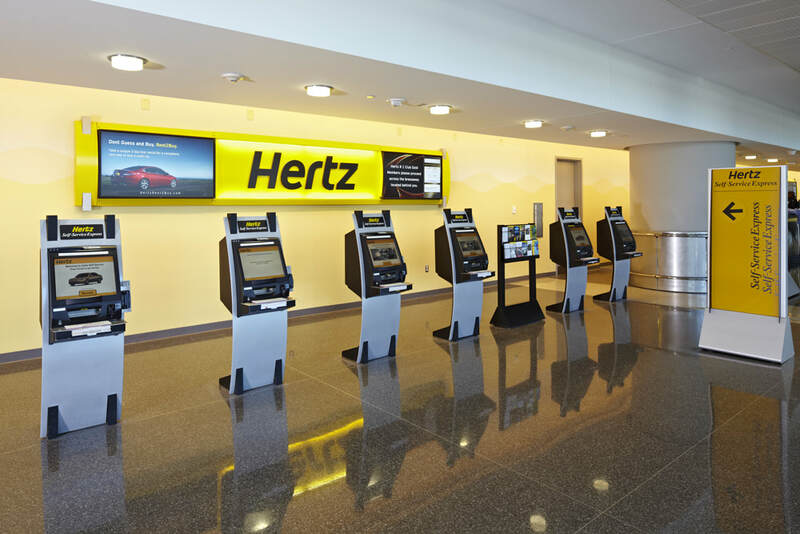 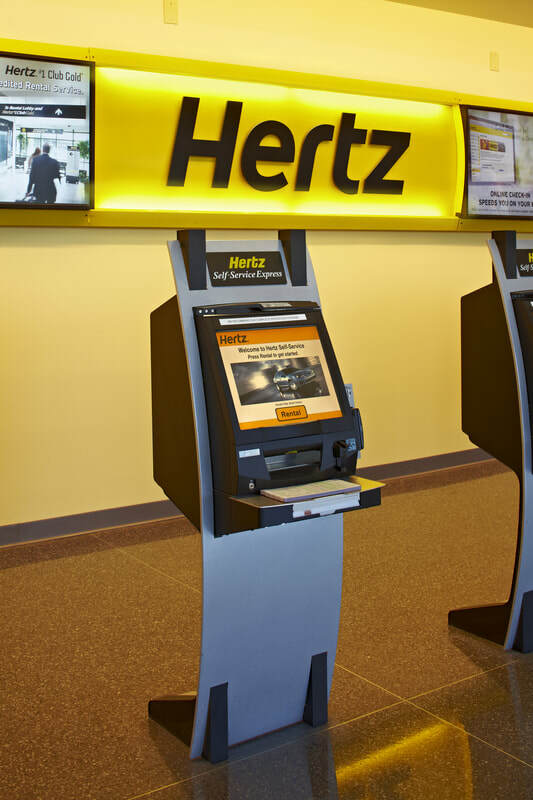 Hertz customers can quickly and easily complete online rental transactions using these Self-Service Kiosks, which are installed and in-use in over 25 Airport locations around the country and overseas.